Welcome to the blog of Martin and Margot Hodson! You can find out a lot about us by visiting our web site at www.hodsons.org We do not think we will use this blog very often, but we will use it to let people have details of some of our publications our speaking engagements and conferences. Some of these things seem better on a blog than on a web page, and this looks a bit easier to do as well. 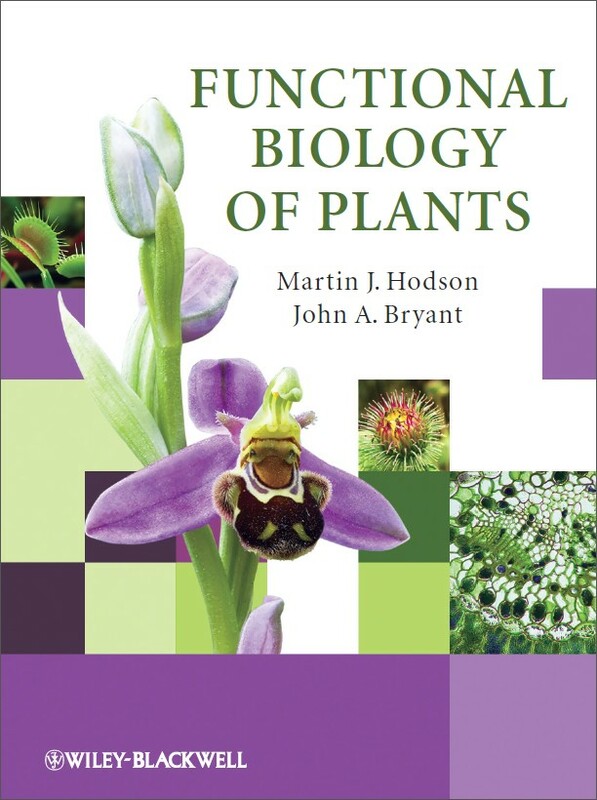 It is one year today (13 Apr 2012) since the official publication date of Functional Biology of Plants by Martin J. Hodson and John A. Bryant. What has happened concerning our book in that time? Quite a lot actually! We were fortunate to have two opportunities to celebrate the publication of our book within the first few months of it coming out. First Martin met with John Bryant when they both attended the same conference in May 2012 (bottom middle photo in the collage above). Then another little celebration! 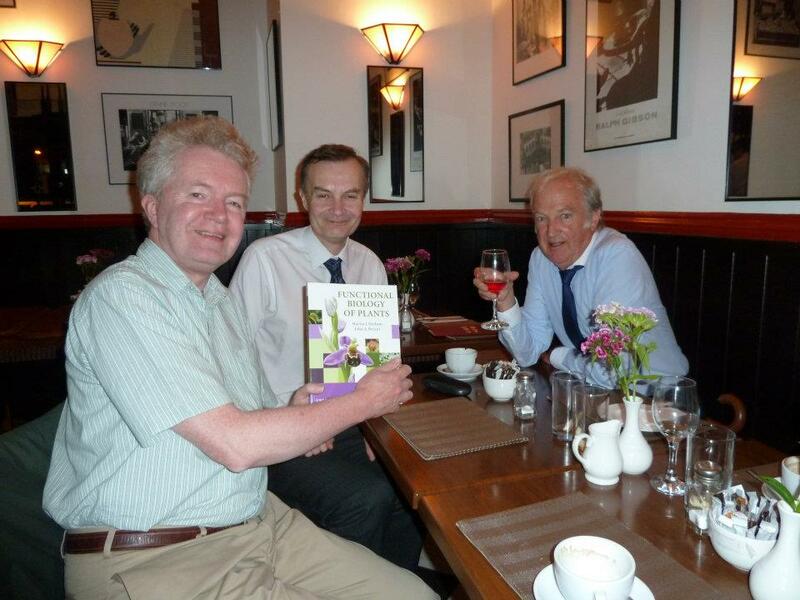 This time in Oxford at Cafe Noir for a nice meal in the company of David Evans (Head of the Department of Biological and Medical Sciences at Oxford Brookes University) and Rachel Wade from Wiley-Blackwell (who took the photo: l. to r. Martin Hodson, David Evans and John Bryant). Martin had quite a bit of experience running various Facebook pages, and this seemed an ideal time to try it out with our book. As far as we know nobody has seriously tried to market a Plant Science textbook, or indeed any other textbook, using Facebook before. We set up the page on 1st March 2012, over a month before the publication date. Martin and John invested a little in marketing the page, and we soon started to gain interest. Our publishers, Wiley-Blackwell saw that it was working and generously added to the overall marketing pot. The page grew and grew, and is now heading towards 5,000 likes, many of which are from India. John and I regularly update the page with photos, stories and the latest from the world of plant science. If you have not visited the page go HERE. 1) Amazon UK have published eight reviews. These have been excellent with seven 5 star and only one 4 star. The latter was really wanting a gardening book, so it is not surprising he felt he needed a brain transplant after reading our book! There was also one further 5 star review in Amazon Japan. Unfortunately, none of the UK or Japanese reviews have translated across to Amazon in the USA. 2) The review with the biggest impact was by Choice who selected our book for their award list: “Students who are new to plant science will be quite well served, as will graduate students and others needing to develop fuller understandings and perspectives on their research.” – Choice, 1 November 2012. This prestigious list contains approximately 10% of the 7,000 titles reviewed by Choice in a year. Ours was one of 24 Wiley titles selected. 3) Reviews in academic journals have been predictably slower, and so far we only know of one. "Martin Hodson and John Bryant have written the most captivating and elementary textbook on modern plant biology. It might be read from cover to cover by anyone seeking an introduction to the subject, but seems especially suited to high school, undergraduate and vocational courses." Philip White in Experimental Agriculture. So as good as it can get! Old Gang mine in Swaledale in North Yorkshire, UK. In addition to the above our book has had some other good publicity during the past year. Before we were even published there was a short note in AoB Blog. Dr Anne Osterrieder has been a good friend of our book. She mentioned our Facebook Page (see above) as an example of good practice in using Facebook in her talk (slide 13) on enhancing the on line presence of scientists at the SEB meeting in Salzburg, Austria. She also interviewed both Martin Hodson and John Bryant for her blog, giving good plugs for the book along the way. Martin was asked to write a review for The Biochemist Magazine on "Metal toxicity and tolerance in plants" and the editor kindly suggested a small plug (and photo of the book cover) within the article. NEXT YEAR- watch this space!